Monaco a track known for it's glits, glamore and the wall of champions. Just ask max Versteppen (too soon?). A circuit that maybe the most mentally draining with the cars coming just millimeters away from the barriers at every part of the circuit. It was clear from Thursday practice that Redbull was going to be a force to be reckon with. The dynamic duo of Riccardo and Versteppen were continuously lighting up the lap charts with sensational times on the new hyper-soft tires. As Mercedes and Ferrari were left scratching their heads searching for more pace. Inconsistency struck max Versteppen once again as another unforced error put him into the barriers at the end of fp3. The pressure was now on the redbull garage to get their man out in time for quali. In qualifying all eyes were on The honey badger as he was on his quest for his Monaco redemption and the redbull garage frantically working to get versteppen out but alas it wasnt ment to be as a gear box issue prevented any further efforts for max. But on the other side of the garage Daniel Riccardo set a blazing new track record around the principality grabbing yet another pole here. Will Canada bring Mercedes to the front? Can Ferrari finally unleash all its ponies? Should versteppen stop trying so hard? Last edited by Mayhem on Sat Jun 02, 2018 3:20 pm, edited 3 times in total. MMMEEEEAAAAAANN while back on our leader board, The streets of Monaco might not of had many over takes but in our race it was a different story as BancieriF1 (+2) swapped places with top banana racing (-2) for the LEAD! UltimoF1 becomes the sole owner of the #2 spot with suit up racing dropping down the field. Big movers this round were CrzyFast and Jenson's Understeer both gaining (+8) and a great showing by last years champ No Limit Excedrin Racing climbing (+7) . Last edited by Mayhem on Sat Jun 02, 2018 4:08 pm, edited 2 times in total. No podiums for me yet? Even Verstappen is doing better than that! True, true. And I feel like 100 points is a very manageable gap this early in the season for this competition, so we'll see where we end up! The fastest lap blunder worked beautifully for me though. I think it's been updated or near to being updated. Unusually late this time! Canada home of Circuit Gilles-Villeneuve. A track known for its high speed, low down force and notorious for providing some of the most exciting races in recent years but would 2018 deliver the goods once again??? 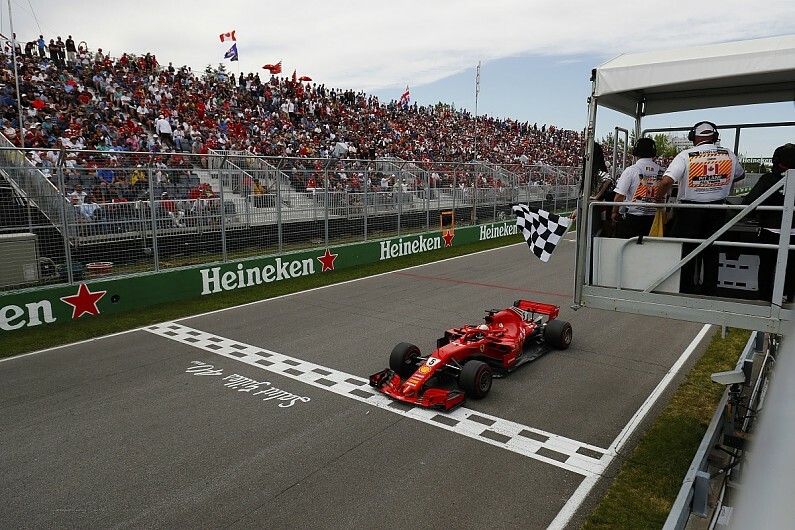 Heading into Canada all eyes were on the Ferrari and Renault powered cars as the Mercedes power unit upgrade had been delayed. With speculation that the engine might not be as reliable as the current unit. The power unit is delayed for further testing. Can Versteppen’s clean sweeps continue ?? Will the Mercedes upgrade bring a win??? Where will Riccardo decide to go???? Only one team really benefited from the checkered flag mishap netting them a bonus of 20pts for correctly predicting all race events, giving them the round win and the Overall points lead. Canada race results as follows. Last edited by Mayhem on Tue Jun 12, 2018 8:23 pm, edited 1 time in total. Meeeeaaaaan while back on our leaderboard we have a new points leader as UltimoF1 makes out like a bandit 🤠 with the checkered flag mishap and grabbing his 2nd win of the season. The field is once again bunching up as only 27pts blankets the top 3 and 7pts separates the top 3 from the best of the rest. We also have pos 5-6 tied, pos 7-9 separated by 7pts, pos 10-16 separated by 14pts and pos 17-20 separated by 3pts. Very tight scoring all over the board. This is also the 5th points leader in 7 rounds with Still plenty to play for as the season progresses. Notable mention to KimiforWDC for being the big mover this round climbing (+8) and Laz_T800 (+6) everyone else stayed pretty close to home. The long awaited French Grand Prix finally returns to the F1 calendar. A circuit that leading up to the race was being doubted by many as a track that wouldn’t allow for much overtaking. Luckily for us those folks were wrong as the Paul Ricard circuit proved to be quite the viewing spectacle. All weekend Lewis Hamilton was the man to chase as he topped all dry practice sessions heading into qualifying. The battle for pole was an all Mercedes affair as no one seemed to have enough for the new Mercedes engine. The fight was now on between teammates, Valtteri who was putting on quite the fight but it just wasn’t enough as Lewis squeezed out just a little more juice in the final sector to pip his teammate from pole. The stage was now set with the mercs 1-2 front row lock out and the dark horse of Sebastian Vettel breathing down their neck waiting to strike on the alternate strategy of ultra soft tires to start the race. At lights out Vettel got away too fast for his own good causing an unforced error which destroyed his and Bottas race from then on. Lewis checkout out at the front and enjoyed a pleasant Sunday drive with Max Versteppen a distant 2nd. But to everyone’s surprise it was the prancing horse of the iceman Kimi Raikkonen whom was shaking and baking in the second stint to grab a well deserved 3rd place finish. Well done Kimi. Can Vettel regain the championship lead? Is leclerc the real deal??? When will Lady Luck shine on Bottas ??? Now, In our race a unorthodox prediction which correctly placed both Ferrari’s in their respective order has netted the first win of the season for this unexpected challenger. Last edited by Mayhem on Mon Jun 25, 2018 8:07 pm, edited 2 times in total. Meeeeaaann while back on our leader board the top 5 front runners all hold positions with UltimoF1 leading the charge. Big mover this round was How F1 gaining (+7) with that round win and climbing to their highest position to date. Plenty of points still up for grabs leading to the summer break!!! The Redbull ring, a circuit with just 10 turns, 3 drs zones and the most devasting curbs in the game. As simple as this layout may appear the elevation changes can catch even the most seasoned driver off guard. Would Redbull finally grab the bull by the horns in their home track????? On Friday Mercedes’s stunned the field, as they unveiled a plethora of upgrades on their new spec b car. Would this be the much awaited dominance many have expected or just a bunch of flash? In practice the new car didn’t disappoint with Lewis Hamilton leading the field in both fp1 & 2. In fp3 Sebastian Vettel finally showed up at the top of the time sheets reminding us all that he was still very much in the fight. But during qualifying it was the flying Finn Valtteri Bottas whom snatched up pole for the 2nd year in a row and giving Mercedes yet another 1-2 lock out. Vettel qualified 3rd but after a 3 place grid drop penalty would be starting from 6th and Ferrari’s hope rested on the ice cold shoulders of Kimi Raikkonen. - Will Mercedes finally start pitting under the Vsc?? - Can haas deliver the good once again?? - When will Bottas catch a break??? Last edited by Mayhem on Tue Jul 03, 2018 9:16 pm, edited 1 time in total. Meeeeeaaaann while back on our leader board the top 5 remain unchanged as UltimoF1 continues their reign at the top but BanceriF1 has reeled in the current points leader and is only trailing by just 1 pt. A 20 pt gap now separates 2nd & 3rd. Project mayhem still leads the midfield in their pursuit of the big 3 and has extended their lead to kc grand pix. The top 10 drivers I tipped in the race were the top 10 drivers in qualifying. I was confident I was on for an absolute haul of points. It’s definately a bummer for sure. On the flip side, anyone who guesses a race like that correct is probably scoring duck eggs most of the time. While I do agree with that statement 100%, that person in particular averages about 18 pts a race . I tallied their points and they would have been 18th moving up to 5th on our leaderboard after that points haul.. just goes to show how easily momentum can change. I'm feeling pretty good about this one. Not going to say too much before I find out how everyone else did, though! The British GP a physically demanding circuit unloading high G-forces through its notorious maggots, becketts & chapel sweeping s-complex. A track that has been dominated by Mercedes power for the last 5 years straight. With Lewis Hamilton the home town hero winning 4/5 races held here. Would it be the welcome home party Lewis expected or would the dark horse Sebastian Vettel rain on the Lewis parade. Going into practice on Friday both Mercedes and Ferrari brought forth more upgrades in hopes of edging one another out of race winning contention. Fp1 went as expected with Lewis Hamilton on top of the time sheets but in Fp2 we saw Ferrari show uncharacteristically fast pace during a Friday session. First time this season in fact. Which had many wondering what exactly were Ferrari up too. In Fp3 it was Mercedes on top once again with Lewis as Sebastian Vettel was tending to sore neck. 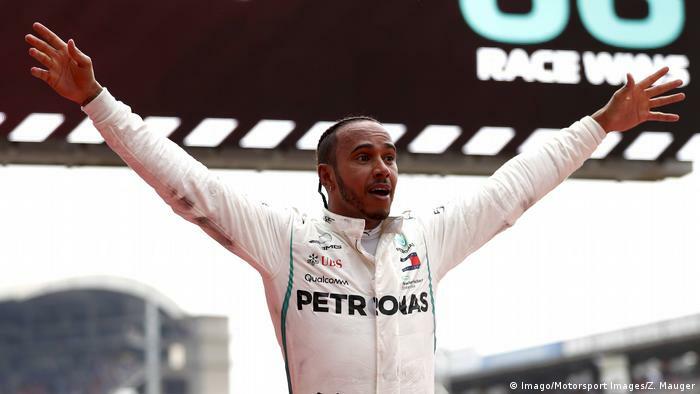 In qualifying it was quite the spectacle as Lewis Hamilton was the first man to dip into the 1:25’s only to be pipped by Sebastian Vettel for provisional pole with an amazing lap on his first attempt in Q3. The two men being separated by less then a tenth of second. Hamilton thinking he had done enough, Vettel going for the jugular. On their final runs Hamilton some how found extra time in sector 2 being willed by the crowd and came across the line to reclaim pole position as Sebastian Vettel did not improve but hold on to you seats folks because Kimi Raikkonen YES that Kimi Raikkonen was on a flier and setting purple times across sectors 1 & 2 but it all came unglued in sector 3 for the iceman. With what could have been the biggest upset of the year. On race day Hamilton was starting at the front with Vettel giving chase at lights out a costly poor start by Hamilton saw him drop down to 3rd with Vettel claiming the lead. To make matters worse Hamilton was spun out and would now have to limit the damage in his world championship hopes. At the front Vettel managed the lead well and it all looked like hopeless for merc but a safety car brought some excitement in later stages of the race putting Bottas in the lead while Vettel pitted for fresh rubber. The Mercedes call didn’t work out as Vettel too his time and made the move on Bottas to reclaim the lead and win the British gp. NOW in our race their was only 1 man devilish enough to predict such a radical prediction. Which allowed him to claim the biggest points haul of the season thus far by correctly predicting 6/10 netting him 170 POINTS, in doing so has sky rocketed his team to the top of the board. CONGRATULATIONS No Limit Exediron Racing aka Excedrin for winning the British GP. Last edited by Mayhem on Mon Jul 09, 2018 8:58 pm, edited 1 time in total. Mmmmmeeeeeaaannn while back on our leader board for the 6Th time this season we have a new points leader. As No Limit Excedrin Racing (+14) dethrones UltimoF1 taking the crown. Ultimof1 & BancieriF1 continue to be just 1pt apart while top banana Racing gets bumped out of the top 3 with the rise of the new points leader. Congrats to Exedrin for ending your podium drought. How quickly things change from race to race in this game never ceases to surprise me. NO POINTS LEAD IS SAFE. Last edited by Mayhem on Mon Jul 09, 2018 9:08 pm, edited 2 times in total. Yes yes yes yes yes! Ta ta ta ta! Grazie Ragazzi. Whooooooooooo! I knew a result like this was waiting out there somewhere and could get me back into contention! It's crazy how much a single great race can do for you - I went from ~750 in the USA to 22nd, and ~10,000 worldwide to ~500. I got three of these big bonus races last year, so here's hoping there's more to come! It's mostly just the Pick 10, honestly. I've been going through a rough spot in the Top Three, but I'm historically quite competitive there. Ever since I fought for the title with Covalent in 2016 and fell apart towards the end I've been totally awful at the Pick 10, however. EDIT: And there's the Group Pick'em, at which I'm astonishingly terrible! Meh, he didn't even correctly guess pole, fastest lap and positions gained - he only got one of the three right. What a bum! Just kidding. That's pretty impressive stuff! Last edited by Mayhem on Mon Jul 23, 2018 12:18 am, edited 1 time in total. Wasn't me, either. I had Vettel down to win, and I would have done pretty decently if he hadn't crashed. I don't suppose anyone is going to score all that highly though, what with the chaos in the midfield and two DNFs out of the drivers everyone is going to have in their top ten. I had 6 of the correct 10 in my picks, but none of them in exactly the right spot. I doubt much of anyone is going to be picking up points for Ericsson or Hartley. I think I'm getting 21 whole points out of this weekend, if my math is on point. I don’t even wanna do the math for mine lol. 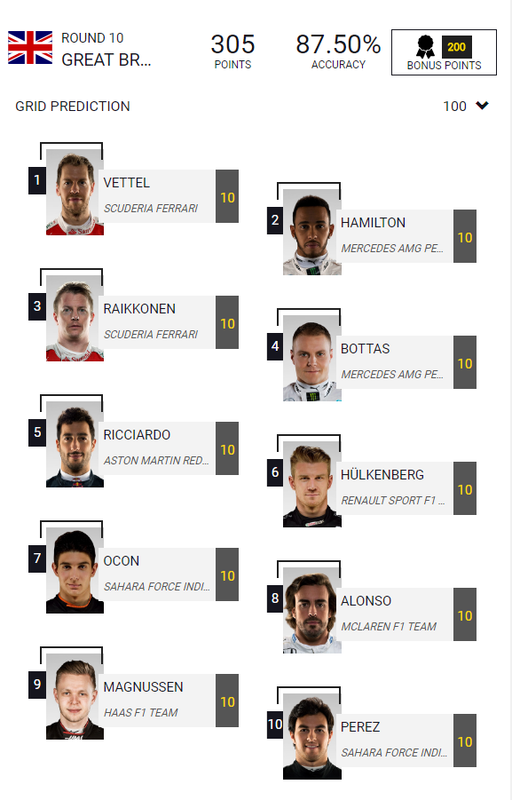 I also had Vettel for the win and that midfield shuffle was disastrous for me. (Leclerc & riccardo also tanked for me) not looking good at all. Hockenheim returns back to the F1 calendar home town favorite Sebastian Vettel leading the championship. Following the foot steps of his childhood hero in the prancing horse. Could Vettel finally win at home????? 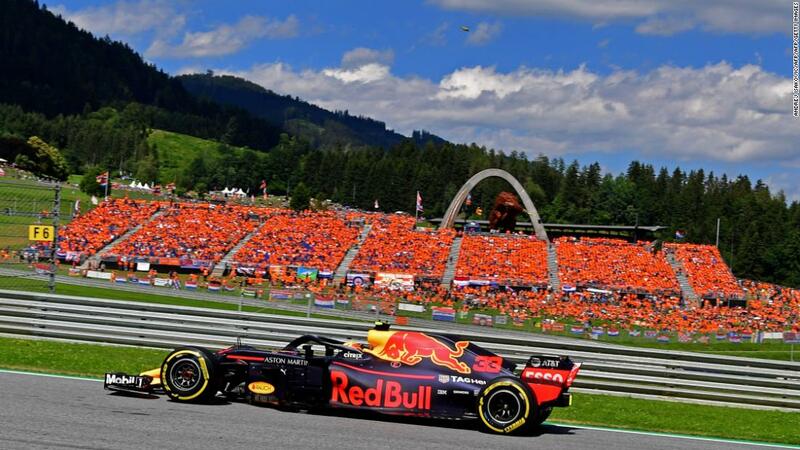 Coming into the race Redbull looked strong in practice 1 & 2 along with Mercedes but as usual the unknown pace of the Ferrari was nothing shy of sandbagging as they didn’t show their true potential. In qualifying a surprising error by Hamilton saw his car lose hydraulic pressure forcing him to stop on track as he desperately tried to push his car back to pits. Gutted by his misfortune of being knocked out in Q1 he kneeled and said a prayer in hopes that he could have a better day on Sunday. The rest of qualifying was nothing short of stellar, as a sensational lap from Sebastian Vettel set a new track record in front of his home crowd. Some pressure did come from Valtteri Bottas but ultimately he could not match the sector 1 time of Vettel which made all the difference for P1. On race day it was an all Vettel affair as the home town favorite was in-front starting from pole, his nearest competitor in the standings starting 14th. Should be a pretty straight forward race right??? Well you couldn’t be more WRONG!! As late showers mid race turned this one into a drama that no one could have predicted. Man those Hamilton prayers are quite powerful I must say because everything went right for him today with a ferocious drive through the field and Lady Luck on his side the man was unstoppable. Can Ferrari be more covert with their team orders ??? Will vettel regain the wdc lead??? Can David Croft be silent for just 1 lap???? Congratulations to “How F1” aka dompclarke for winning the German GP. Last edited by Mayhem on Wed Jul 25, 2018 1:07 am, edited 4 times in total.